Last Halloween we hosted a Halloween Party for a bunch of friends after school. 4 moms worked together each doing a different station/activity/game. The kids had a blast and so did we. 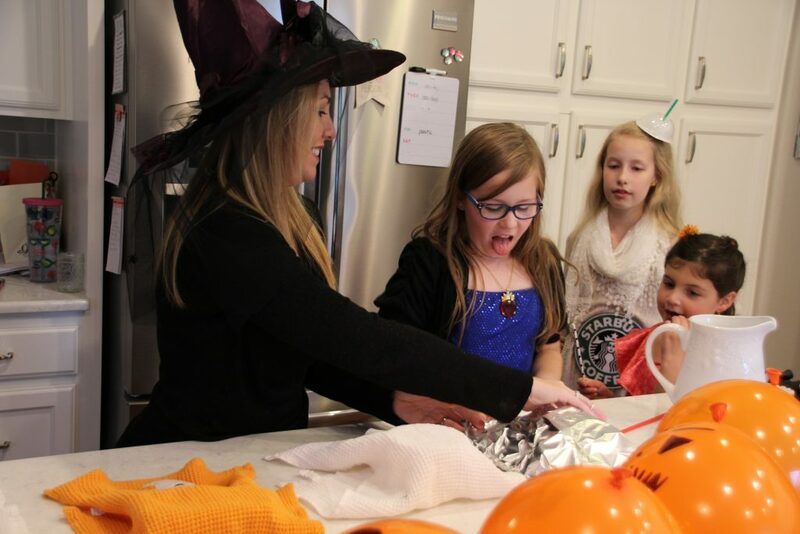 Typically we just dress up and go trick-or-treating, but this was an easy way to make the day even more special. 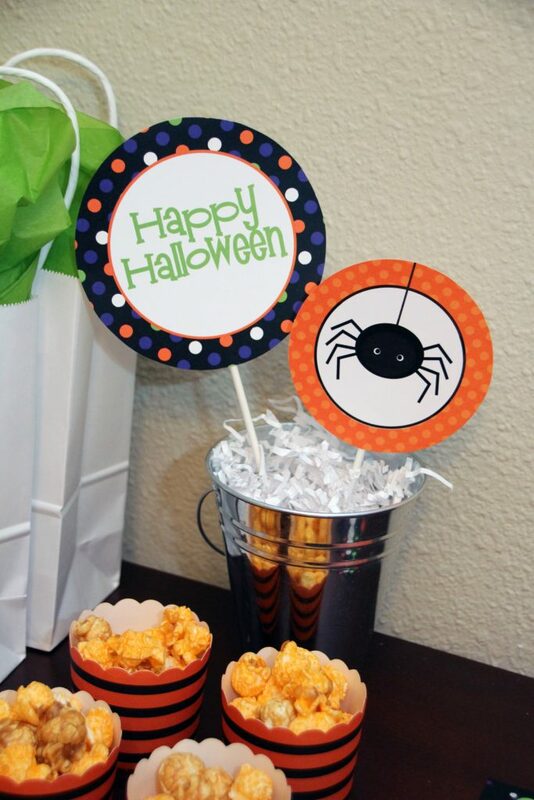 My printable Halloween Party Decor package made this party so easy to put together. 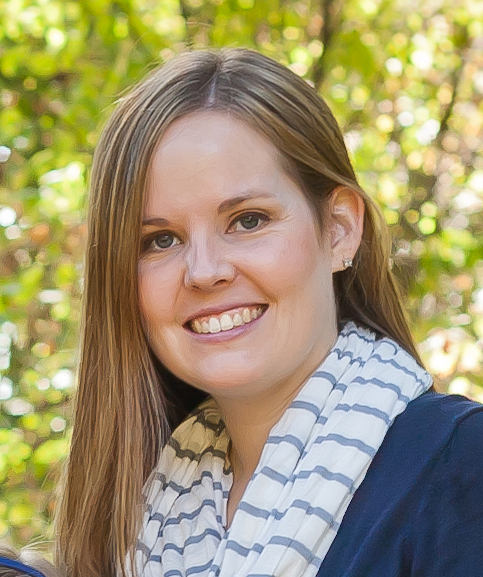 I hope you find some fun ideas you can use as you read along. I love all the colors in this Trick-or-Treat Banner. The orange, green and purple create a colorful space. So many fun patterns and it comes with several images as well. I normally use this above my front door to greet kids on Halloween night. 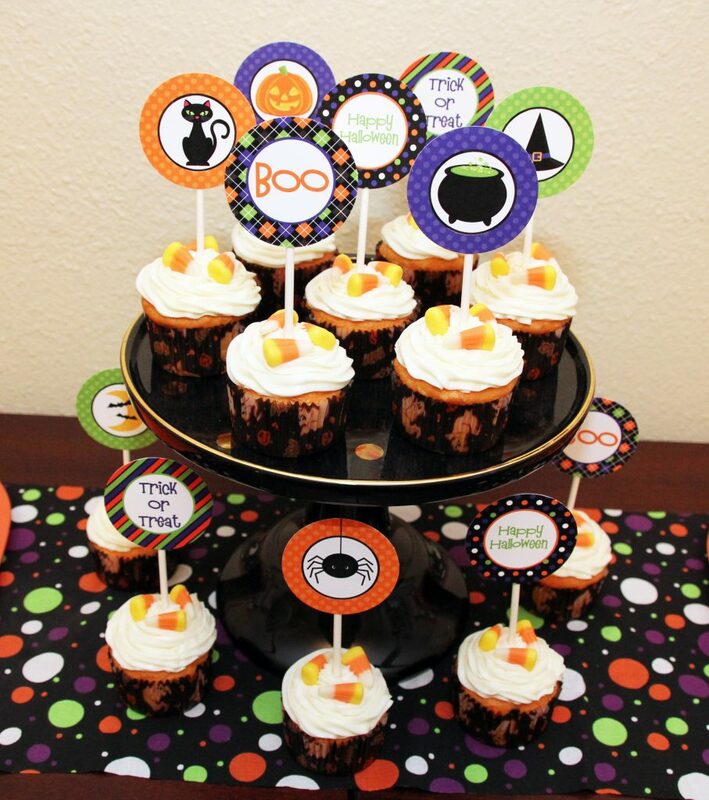 My printable Halloween cupcake toppers have tons of cute Halloween images (pumpkin, black cat, witches hat, cauldron, spider, and moon) and sayings. There is nothing spooky about these cuties. 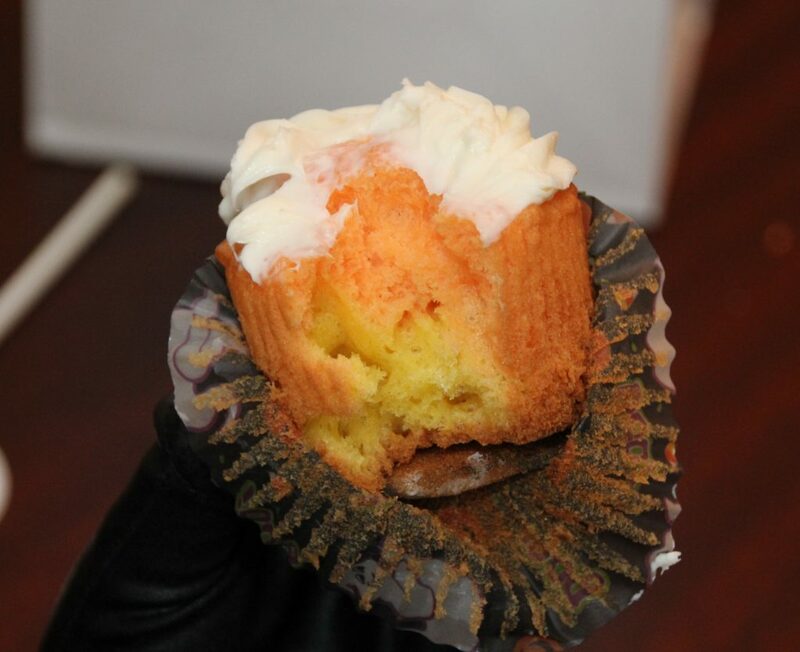 Dress up a store bought cupcake or make a fun candy corn layered cupcake at home. 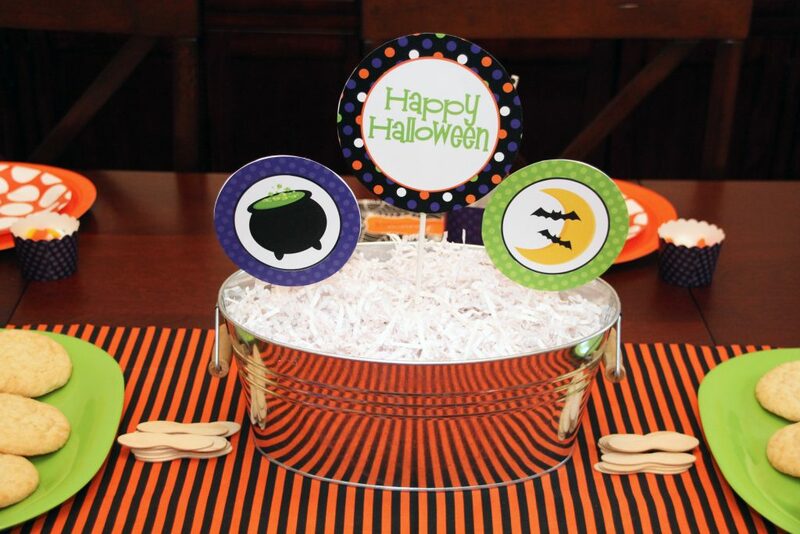 This printable Halloween party set comes with lots of fun centerpiece options in all of the images you loved in the cupcake toppers above. 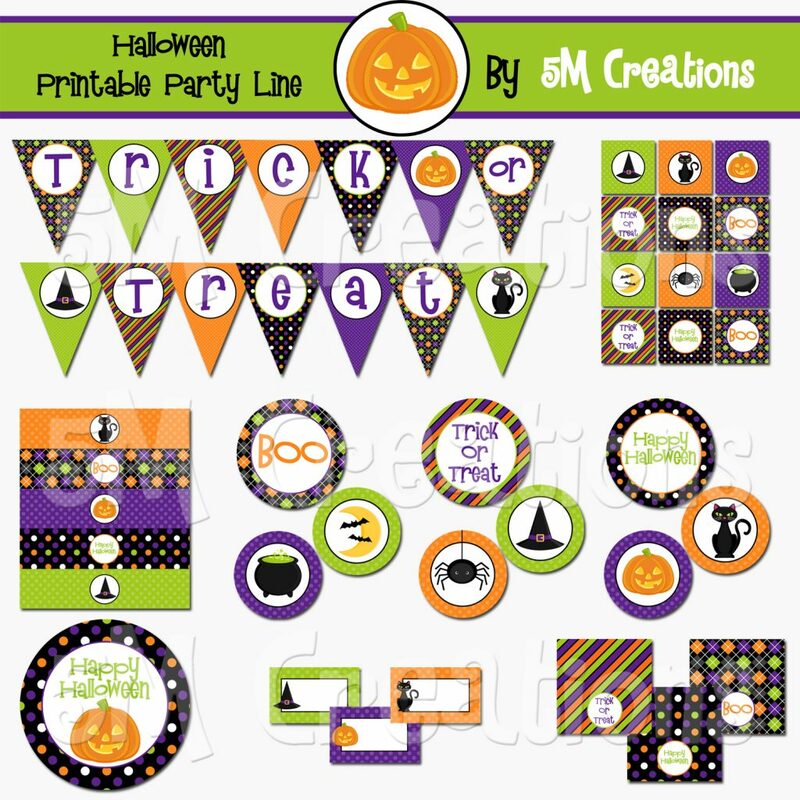 You could easily leave out the Happy Halloween wording and use just the images in this set for a Halloween themed birthday party we well. 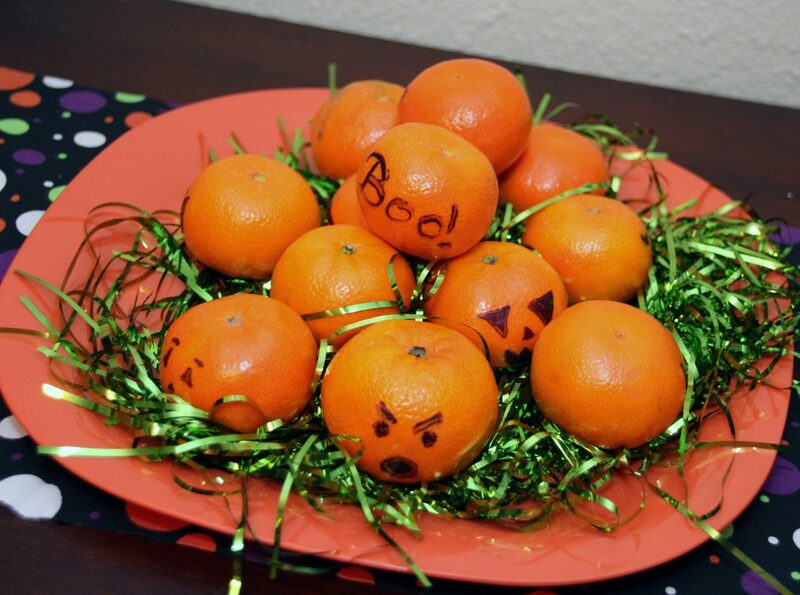 I created this Halloween centerpiece double sided so everyone around the table could enjoy it. More of the centerpiece circles were used on the food table in smaller sets of 2. These centerpiece circles are so versatile and add a ton of color and fun to any party space. 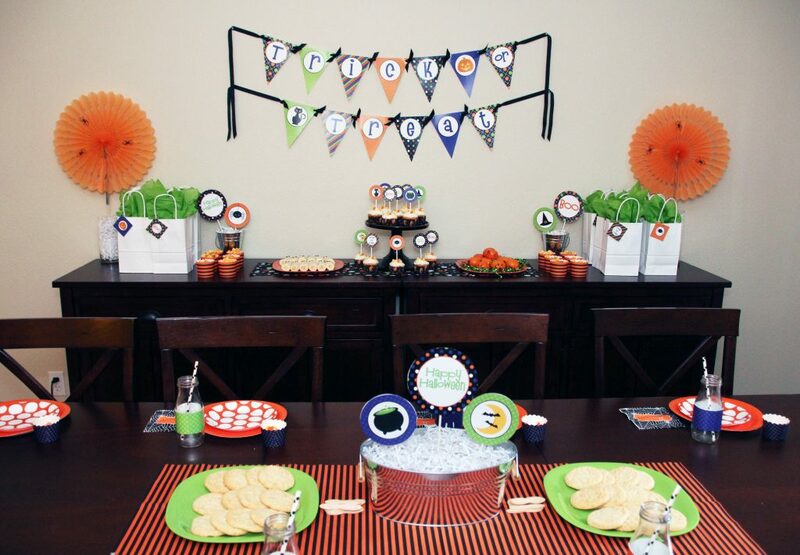 I used paper fans on the walls and on sticks on the main table to fill in some empty areas in the party space. 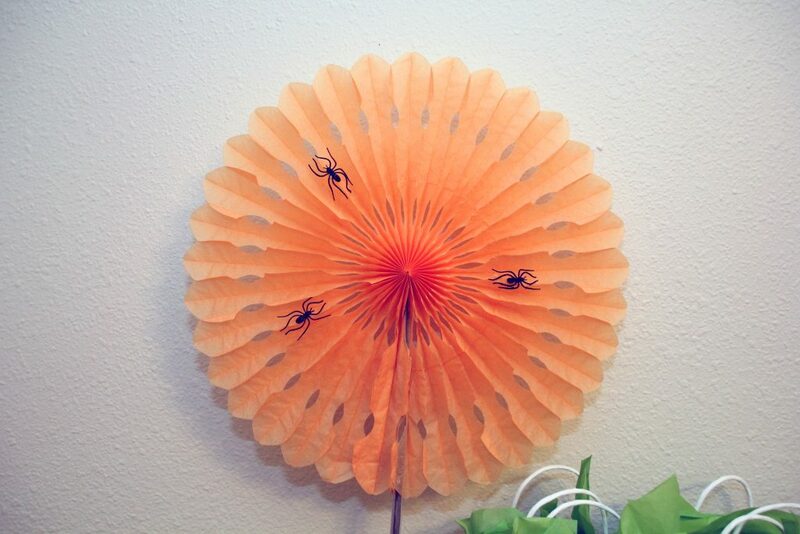 Add some cute plastic spiders for a spooky touch. 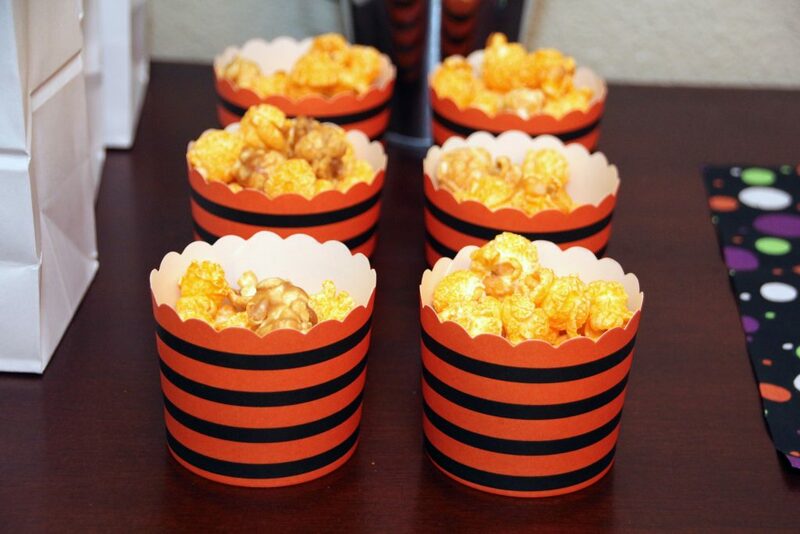 Our favorite cheddar and caramel popcorn mix in cute striped treat cups made a easy snack to hand out to the kids. 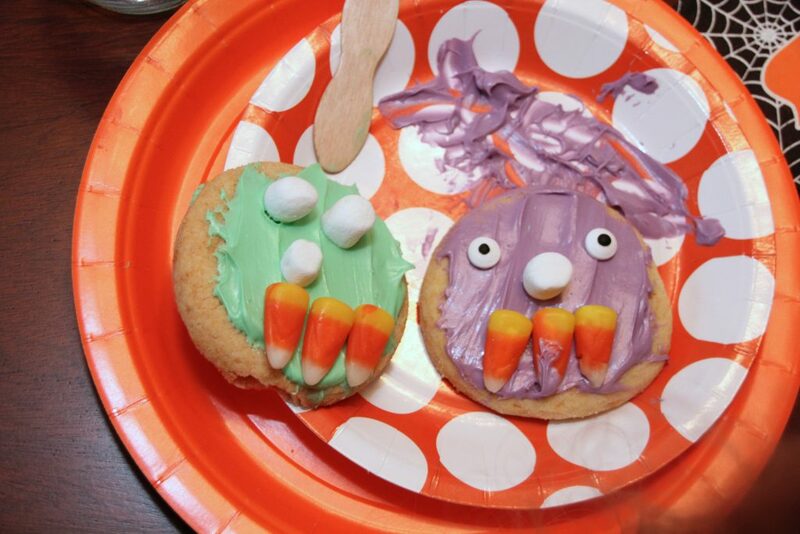 Since Halloween is full of all kids of sugary treats we tried to add a few healthier ones as well. 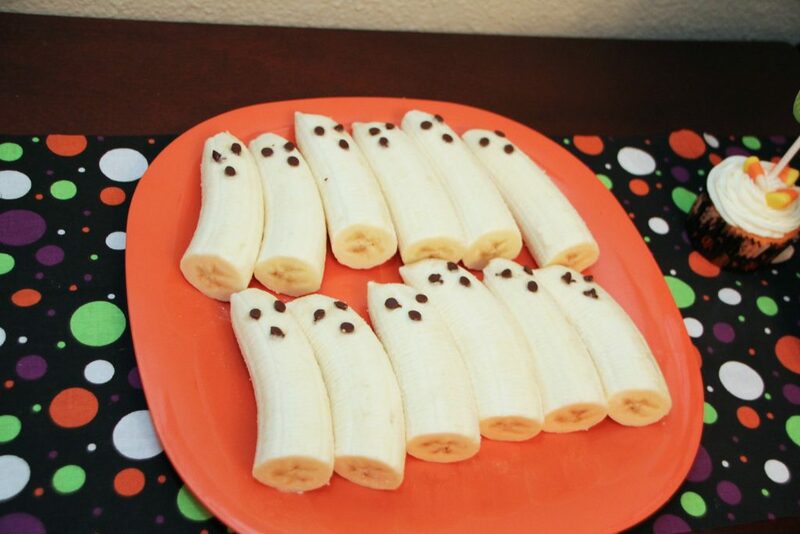 These ghost bananas and jack-o-lanterns were the perfect addition. The kids gobbled them up. 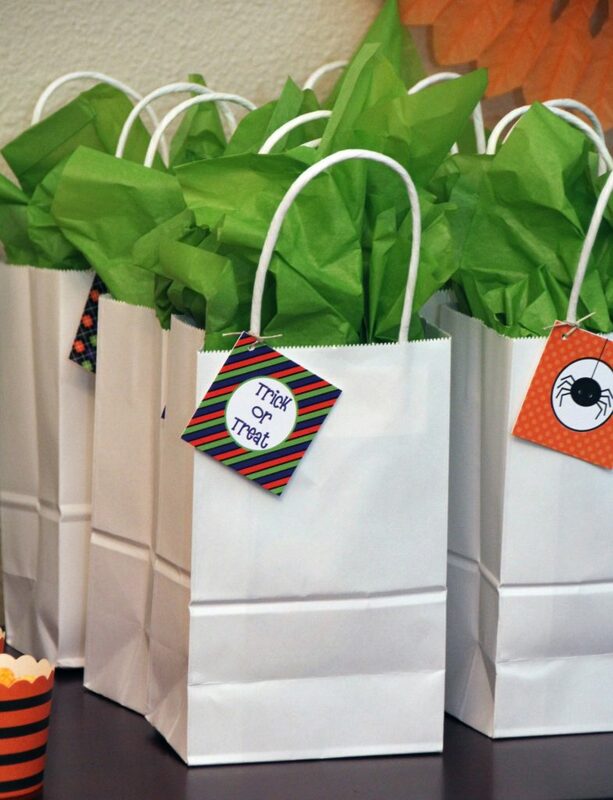 Printable favor tags on white bags held all sorts of non candy goodies for the kids to enjoy after the party. I love having a little something to send with my guests. 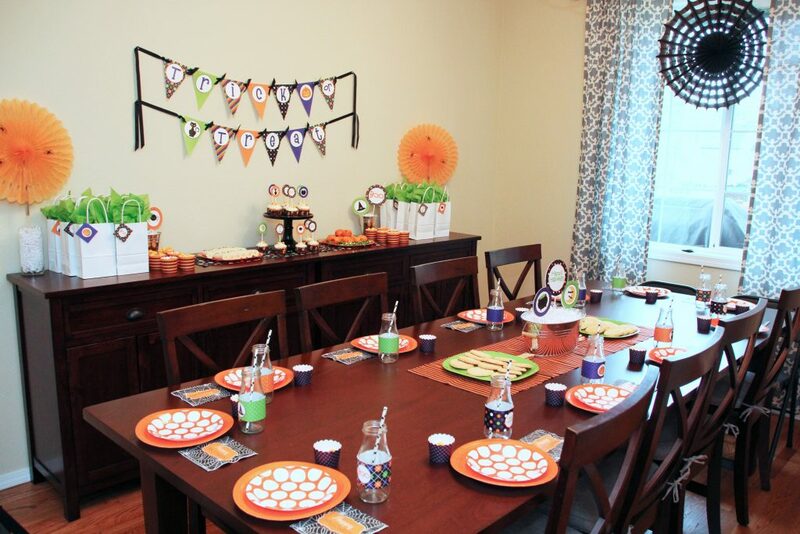 A boring formal dining room quickly became a fun Halloween space with lots of colors and patterns. Don’t be afraid to layer all types of colors, patterns, and textures in your space. 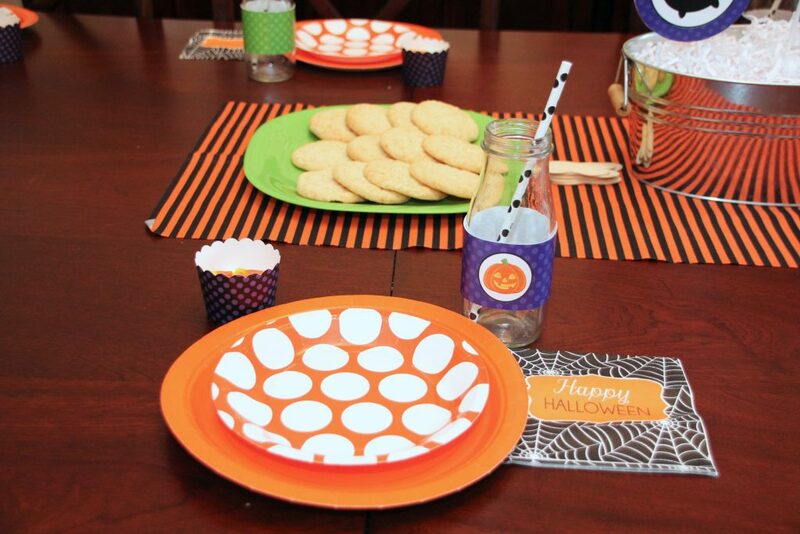 Water bottle wraps on glass starbucks bottles, layered orange plates, spider web napkin, and treat cups created a fun place setting for each kid. 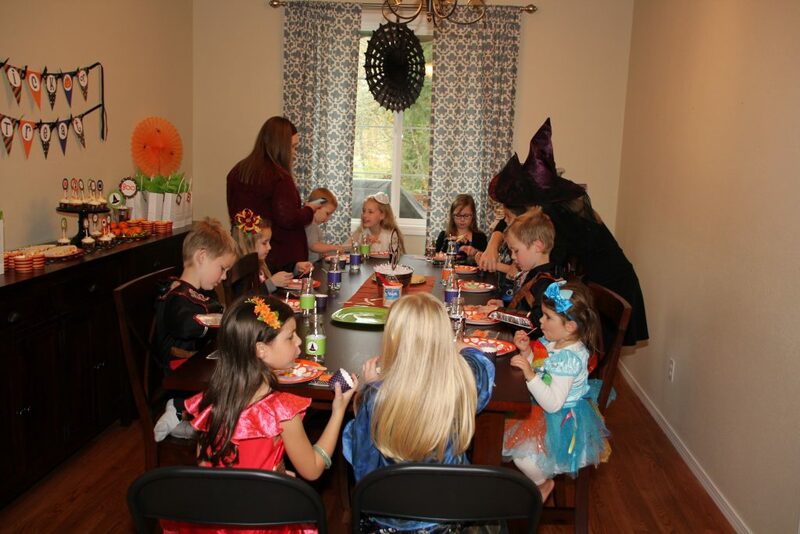 My dining room filled up quickly with lots of noise and adorable costumes! 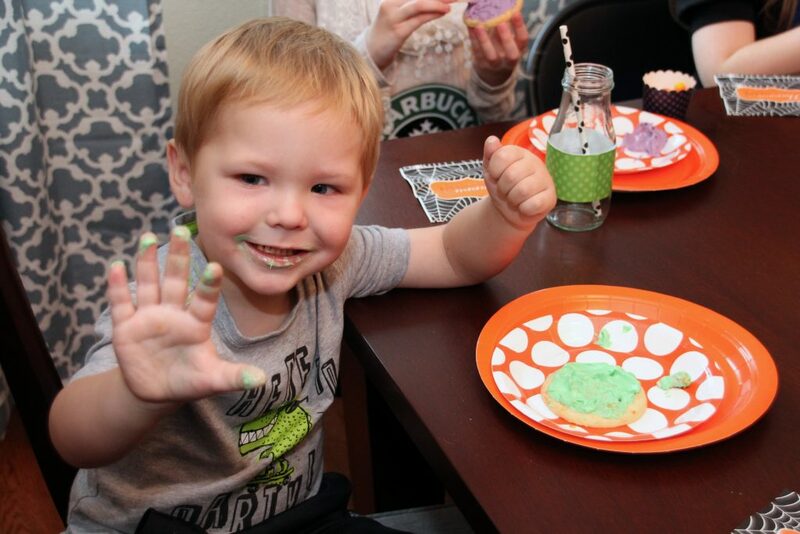 Sticky fingers created monster faces on sugar cookies for our first activity. Yes we still had some sugary treats. It is Halloween after all. 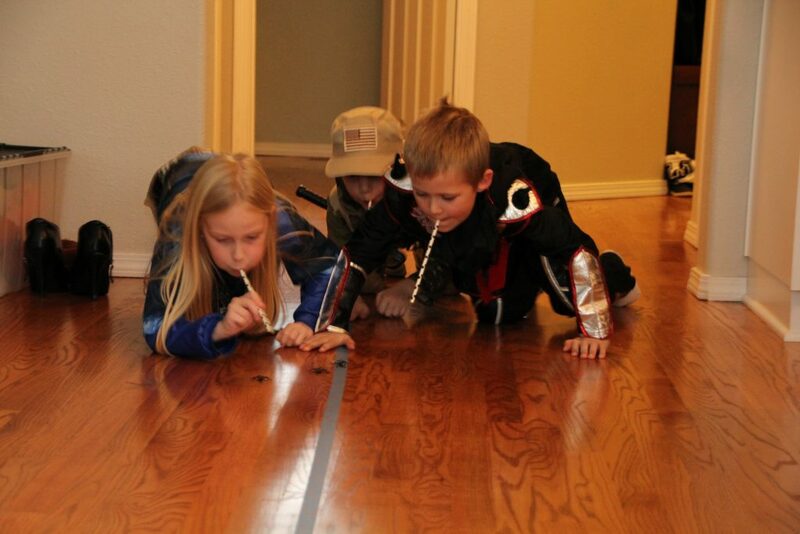 Next we split the kids up into groups and had them rotate stations each with a different kids Halloween activity. The first was a blind spooky feel game. Each child reached under the towels to guess what was inside. A jello brain, worms(cold cooked spaghetti), witches hair(dry spaghetti), Eyeballs(wet grapes). Get creative. There are so many creepy things you could create with this game. As you can see it was a successful activity. haha! We had a monster bean bag toss. 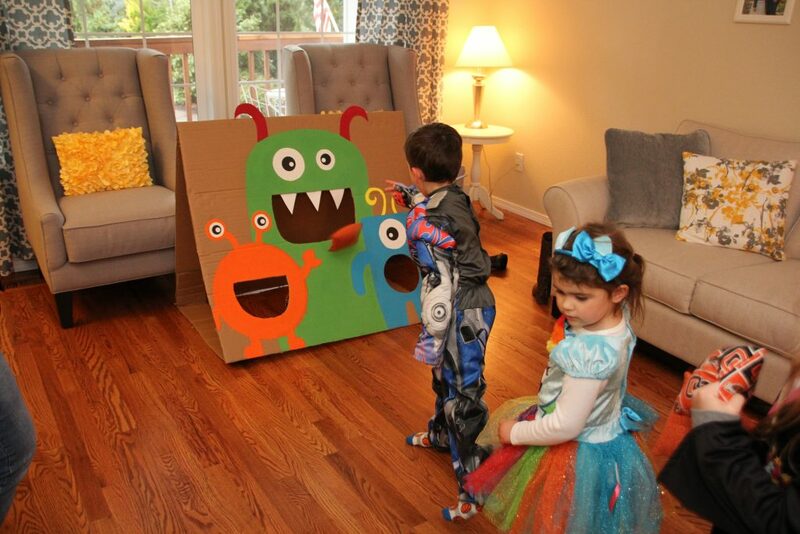 This was created with a giant piece of cardboard and craft paint for my son’s monster birthday party. Post coming soon! 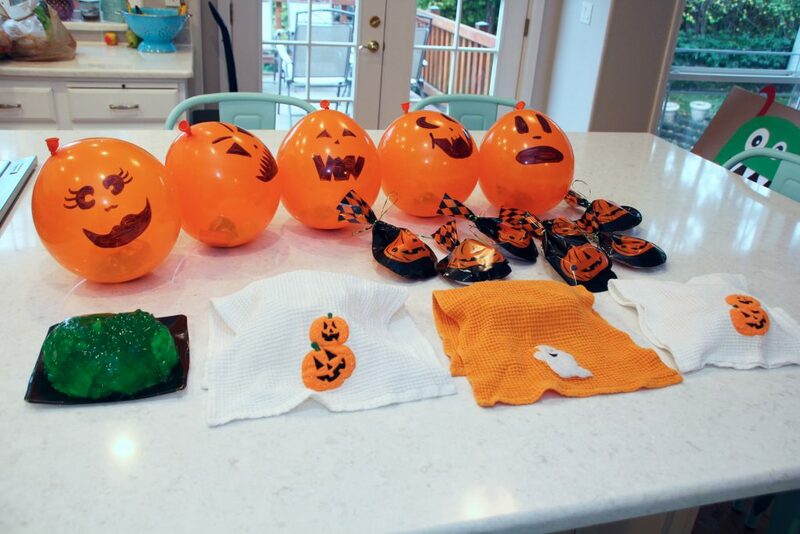 It was perfect to use for our Halloween party as well. Next we had a spider race. I placed a piece of painter’s tape down the middle of the floor. The kids each got a straw and plastic spider. The goal was to be the first to blow it across the finish line. They played this over and over and over! 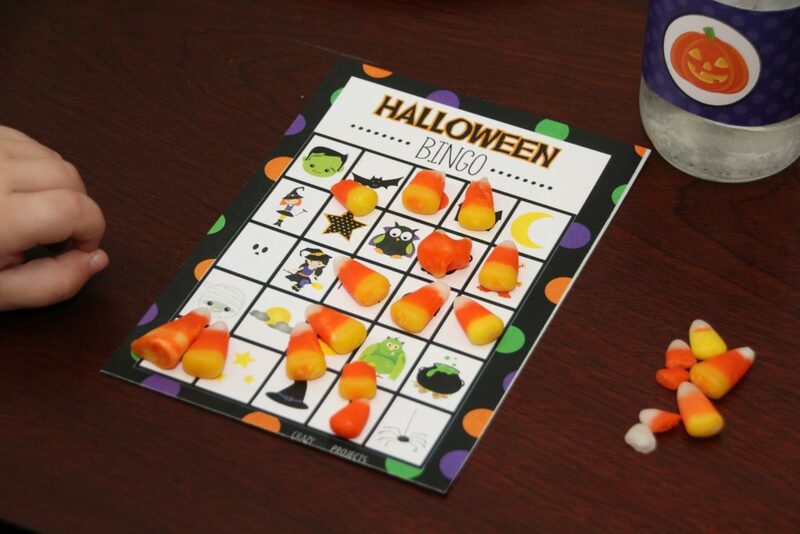 Last, to quiet things down we did a round of Halloween Bingo. My friend brought these cards from a printable set she had purchased previously on etsy. I am not sure who the exact seller is but there are tons of options on etsy to choose from. We played until each child got a bingo. They got their favor bags as their prize. 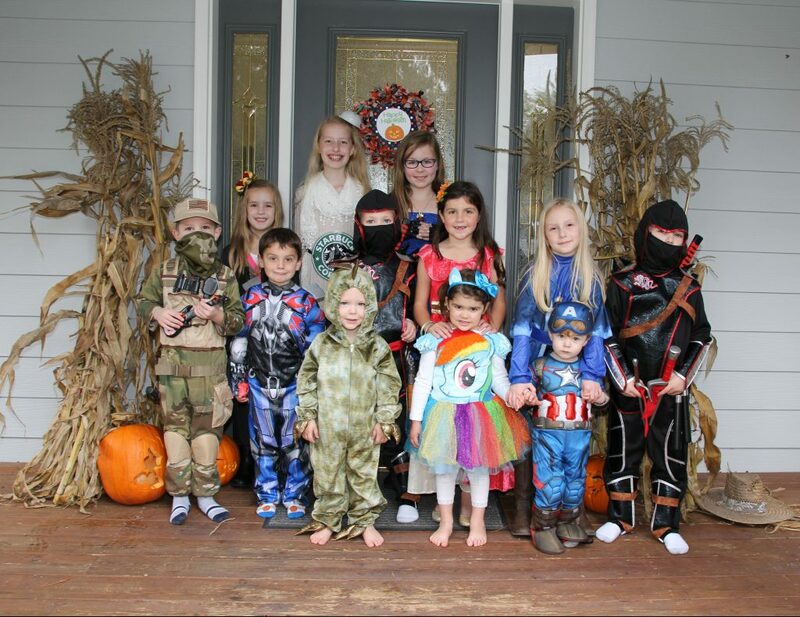 12 cute kids in costume and 1 successful Halloween Party! We all had a spooky, sticky, noisy, fun time! I hope you use some of these ideas to create your own party. You can find the printable package including everything you saw and more in my etsy shop. Matching invitations are sold separately.